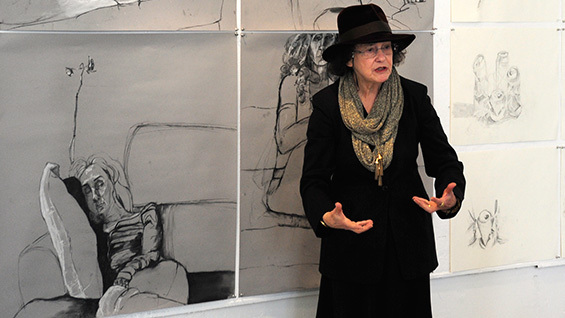 Offering a rare opportunity for anyone to take a drawing class with one of the most venerated instructors of drawing in the field, The Cooper Union has announced an open enrollment Master Drawing Class taught by Sue Ferguson Gussow (A'56), Professor Emerita. Ordinarily one could only take such a class by matriculating into one of the most exclusive and rigorous undergraduate architectural programs in the world. But in an elegant confluence of fundraising and pedagogy, anyone can take the singular four-session course with a minimum contribution of $1,500, with proceeds benefiting The Cooper Union and the Irwin S. Chanin School of Architecture. Enrollment ends on September 27th and the class begins October 3rd. Though Prof. Gussow has written "the book" on drawing for students of architecture (Architects Draw: Freehand Fundamentals; 2008; Princeton Architectural Press), this "Master Class" will be geared towards anyone, regardless of their level of experience or focus. "When I am teaching, I don't like to think in terms of amateur or professional. It's a continuum," Prof. Gussow says. "It is not unlike dancing. People think they can't dance, yet despite our range of physical abilities, we can all experience dance. But we are often inhibited, thinking, 'I can't dance.' It is not too different with drawing. Even people who draw very well sometimes give up on it thinking they are not quite good enough. My philosophy is that everyone can draw to one degree or another; just as everyone can dance and take pleasure in it." Prof. Gussow has taught drawing at The Cooper Union for over 40 years, beginning in the School of Art, later becoming the first woman appointed as full time faculty at the School of Architecture. Judith Gerrard (AR'83), a principal at Gerrard + Tan Architects, who has taken several classes with Prof. Gussow, will be returning to re-experience, "a magic moment where you transition in the way you perceive things." she says. "You start by looking literally and then you move into a more inspired way to perceive an object. In Sue Gussow's classes, you get a lot of personal attention, a lot of guidance on how to improve hand-eye coordination, but also guidance on improving your personal vision. She encourages rigor and inspiration, creating a certain way of thinking that applies to other problems as well." Laura Simich, the mother of fourth-year architecture student Jacob Gurin, has signed up even though she has never taken a class like this before. "I work as an anthropologist and painting and drawing have always been something I've wanted to pursue," she says. "I've been looking for courses that I could work into my schedule that would be high quality and inspiring. Then this opportunity came along that would also allow me to support Cooper Union. So I am looking forward to it." "Since it is a four session course I will try to pack it as full as I can with problems and techniques," Prof. Gussow says about her plans for the classes. "Each class will be a real, true workshop spending the class drawing. For at least some of the sessions there will be a live model. So there will be drawing from life. But I will design it as we go along relative to what would seem best suited to the individuals in the class. Each class has its own personality and gives rise to certain issues. Of course on the first day I will have something prepared." What can students expect that first day? "It's a secret," she says. "It will be a surprise." Though the notion of a Master Class taught at The Cooper Union by one of its most eminent faculty members may seem intimidating, Prof. Gussow puts you quickly at ease. "I know that I will be nervous and then get over it," Ms. Gerrard says. "She has instilled in many people an enduring love of drawing, myself included." Prof. Gussow's goal for the class reflects both the patience and the ambition of a great teacher. "I hope students gain a greater enthusiasm for drawing and a greater confidence to draw so they will continue on their own," she says. Prof. Gussow's Master Drawing Class will occur each Thursday October 3, 10, 17 & 24 from 6:30 to 9:30 pm at The Cooper Union. Enrollment ends September 27 and requires a minimum $1,500 tax-deductible contribution. Proceeds benefit The Cooper Union and the School of Architecture. Enrollment is still open but seats are limited. Inquires should be sent to Jennifer Durst, Major Gifts Officer.